Jackpot games are extremely popular among the bookies in Nigeria and Betway does not make an exception in this manner. In this betting house you will find three Jackpot games in total and each of them has different rules, while the Jackpots they offer reach up to 500 000 000 NGN. For those of you, who have never played games with predictions and with accumulated jackpots, know that they represent a preliminary established list of sport events chosen by the bookmaker and for each of these events the punter is supposed to make a prediction by betting a certain amount of money in advance. The punter needs to wait for the final outcomes of all the games and depending on the number of the correct predictions he or she will gain a certain amount of money. In case the punter succeeds in guessing all of the matches, he or she will win the entire game Jackpot which is also established in advance. What are the three Betway Prediction games? The Colossus – In the Colossus game the customer needs to predict the correct scores in 7 of the most interesting matches from the next few days. The Jackpot amount in this game is 500 000 000 NGN – the biggest one among all of the three jackpot games the bookmaker offers. The punters who manage to predict correctly 4 to 7 matches split the amount of 320 000 prize fund, those with 5-7 predictions – 300 000 NGN – and the punters with 6 right predictions share 500 000 NGN. CS Pick 6 – In this game it is required to predict the correct scores in football matches, too, but here they are 6 in total. This is why the amount of the big reward fund is smaller – 100 000 000 NGN. Here the prizes start with 3-6 correctly predicted matches with about 143 000 NGN prize fund, 4-6 matches – nearly 110 000 NGN and those who guess 5-6 matches share 200 000 NGN. In difference to the previous game, The Collosus, which is a weakly game, CS Pick 6 is arranged on a daily basis. 1X2 Pick 15 – The main purpose in this game, which by the way, is held twice per week, is to correct the final outcome in 15 football matches but here, you do not have to predict the correct score, but only the team who is going to get the three points (or if the match is going to be a draw). The big winner gets 80 000 000 NGN and prizes are also given to those who guess the 1X2 symbol in 11-14 matches by sharing prize funds respectively in the following amounts – 800 000 NGN, 600 000 NGN, 400 000 NGN and 2 000 000 NGN. How to participate in the Betway Jackpot games? 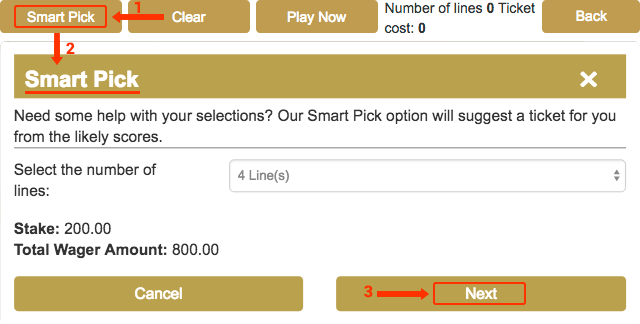 You need to visit the Jackpot category of this bookmaker, then, to take a look at the matches from the program and to press on the result / final outcome you predict. Right next to each of the sport events there is a button for an access to statistics which will help you to make your selection. The gambling house also offer the Smart Pick button which automatically will choose instead of you a prediction for each of the matches basin on the available statistics. When you mark your prediction for each of the games, press on Play Now, review your predictions for eventual mistakes and if everything is fine, press on Bet Now. The price for one single line is 200 NGN. If you wish to, you can select more than one prediction per match but each next additional prediction leads to the increase of the total bet amount.